Modular Imaging systems for ultrasonic evaluation of aircraft and bridge structures. Hardware modules for Lutrasonic Inspection of aircraft and bridge structures. Software modules for ultrasonic Inspection of aircraft and bridges. Ultrasonic imaging is becoming more and more preferred by NDT operators to visualize the results of an ultrasonic inspection. Using comprehensive ultrasonic images of inspected areas, maintenance managers and engineers can make accurate decisions on steps needed to correct a problem. However, an imaging technique requires an adequate level of the equipment for data acquisition, processing, and representation. In turn, the application of more sophisticated equipment is usually associated with a higher price and additional requirements for the training of operators. Therefore, it is necessary to optimize the procedure for ultrasonic imaging of defects using specified criteria for ultrasonic data selection and representation. The concept of a modular imaging system with interchangeable components will be presented. The modular concept provides greater flexibility in the integration of custom-designed elements of the system with standard commercially available units deployed by operators. The ultrasonic techniques have been developed to satisfy flaw detection and imaging criteria as well as ultrasonic equipment capabilities. Applications of the modular imaging system to characterize internal cracks in multilayered airplane structures and fracture critical components of steel bridges will be discussed. Ultrasonic imaging, modular inspection system, aircraft inspection, bridge inspection. Non-destructive inspection (NDI) techniques as a part of the manufacturing and maintenance technologies play critical roles throughout the lifecycle of aircraft and bridge components, from initial design considerations, to production, and to final in-service operation and maintenance. Without compromising the reliability and longevity of aircraft and bridges, the cost-effective maintenance of the structures has become an important factor for owners and operators. The overall reductions in expenses for operation and maintenance place lower limits on the cost of NDI services and instrumentation. Another common approach to cost reduction in maintenance is the increased use of third party inspection and maintenance facilities. These smaller companies simply cannot afford high-tech inspection systems used, for instance, by aircraft manufacturers. On the other hand, outsourcing has additional implications on the conceptual design of NDI systems. As maintenance functions become physically removed from operation functions, communications of the relevant inspection data and the resulting decisions based on that data become even more critical. While small inspection shops may perform the inspection functions, responsibility for adequate maintenance of the structures remains with the owners and/or operators. Hence data storage, on-line and post-processing analysis, and formats of the data presentation become increasingly important factors for faster and easier interpretation of the inspection results and more effective decision making. Data storage and analysis are also very important for tracking industry maintenance and damage trends. Digital storage of inspection data will enable comparison of inspection records from different maintenance facilities, resulting in the additional benefits of tracking flaw occurrence rates. Extensive data storage and data analysis is virtually impossible without increased use of computers. However, high-tech computerized inspection systems with full scale imaging capabilities are very expensive, and their applications in the field or even at small maintenance facilities are pretty much cumbersome. This paper will present the concept of a modular inspection system with data acquired by portable commercially available inspection devices (flaw detectors) and displayed in image formats. Several modular system configurations that were developed for ultrasonic inspection of multilayered airplane structures and components of steel bridges will be discussed. Conceptual block-diagram of a modular non-destructive inspections system. The concept of a modular inspection system is based on the integration of the interchangeable commercially available or custom-designed elements. The inspection system consists of hardware (sensor, coupling, scanning, data acquisition, data post-processing and display, calibration specimen) and software (set-up, imaging, calibration) modules. The block-diagram of the system for NDI is depicted on Fig. 1. Since most of the modular systems incorporate both commercially available and custom-made components, the development of the system for a particular application should begin from the proper selection of the basic commercially available elements. First, NDI equipment that is widely used in industry or in common use at a particular group of maintenance or inspection facilities needs to be identified and classified with respect to capabilities and constrains. The units that satisfy most of the inspection requirements are selected as sensor, data acquisition, and etc. modules of the inspection system. Deployment of the commercially available units will significantly reduce time and cost of the system development and integration. If necessary a configuration of commercial units, for instance sensors, signal generators, and amplifiers can be used instead of a single standard or custom-made component. Next, the generic inspection technique is developed to satisfy required probability of detection and other inspection criteria. This technique needs to be compatible with selected standard equipment units, so that modular system elements can operate together. Custom-made hardware elements and interfaces will be added to facilitate the integration and operation of the modular system. These elements include sensor holders, coupling units, scanning devices. Sensor holders can be designed to contain a configuration of sensors or sensor arrays suitable for the developed inspection technique. The deployment of interchangeable coupling units makes it possible to inspect rough surfaces or surfaces with complex profiles and protruding elements. The scanners with linear, dual-axis, or rotational drivers should provide capabilities for wide area inspections on components with various spatial orientations. The data transfer protocol and the standard or custom-made software modules are selected to suit the type of NDI hardware modules that have been chosen for the application. On the other hand both the format of the procedure for data processing and the format of data presentation/imaging are based on the type of flaws and configuration of the inspected structure. Various formats of the data presentation can be included in the imaging module on-screen menu to allow selection for number of applications or hardware modules. Hardware modules for Ultrasonic Inspection of aircraft and bridge structures. The sensor modules contain commercially available longitudinal or shear wave transducers. The modules include an adjustable transducer holder with a precise positioner, and a housing with a gear system, rails, and a stopper for linear movement. The transducer holder is designed to make adjustments of three variables (two linear and one angular) of an ultrasonic transducer position. The sensor module can also include an encoding unit. 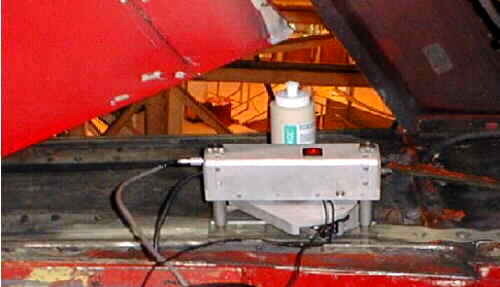 Figure 2 shows the sensor module for ultrasonic inspection of DC-10 aircraft. Fig 2: Sensor module for ultrasonic inspection of a DC-10 spar-cap/strap connection. Fig 3: Scanning system for imaging of fatigue cracks in a DC-9 rear spar. Another transducer holder for dual transducer configuration is shown on Fig. 3. This holder is part of the scanning unit that was developed for imaging of cracks around fasteners in a DC-9 rear spar. The coupling module is necessary when components with non-uniform surfaces are inspected. Various types of the coupling modules have been developed for ultrasonic inspection of pins in the pin-hangar assemblies of steel bridges. In the first generation of the coupling modules an immersion ultrasonic transducer was contained in a water-filled unit with a flexible membrane. However this type of the coupling system was found to be ineffective for field applications. A special water supply that was required for the unit made the ultrasonic procedure too cumbersome for inspections at bridge sites. Hence a new concept of coupling has been developed for the second-generation unit. The water-filled unit was replaced by a special coupling plate made from acoustically transparent material. This coupling plate made it possible to maintain reliable contact with the non-uniform surface of the pin while scanning it with a contact ultrasonic transducer. The coupling plate for the bridge inspection is shown on Fig. 4. A similar approach was used to develop coupling modules for aircraft applications. Figure 5 shows the coupling modules that were used for the inspection of DC-9 and DC-10 aircraft. Fig 4: Coupling module for ultrasonic inspection of pins in pin-hanger assemblies of steel bridges. Fig 5: Coupling modules for ultrasonic inspection of DC-9 and DC-10 aircraft. Fig 6: Field test of the ultrasonic imaging system at Northwest Airlines Maintenance Facility. Fig 7: Modular system for ultrasonic inspection of Fairchild SA 226 commuter aircraft. Fig 8: Calibration specimens for ultrasonic inspection of aircraft structures. Fig 9a: a)Circumferencial images of flaw in bridge pin. Fig 9b: b) radial images of flaws in bridge pin. To scan the inspected area, contact ultrasonic transducers are moved on the top of the coupling plates using semi-automatic linear, dual-axis, or rotational scanners. Several scanning systems have been developed at Northwestern University to characterize cracks in the internal layers of multilayered airplane structures. 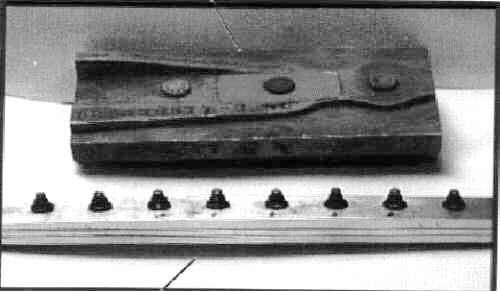 The line scanner was developed to detect and size cracks in the rear spar of a DC-9 wing structure (Fig. 3). Another scanning system with a combination of rotational and line scans was developed to image cracks of various orientations around fasteners in the DC-10 spar-cap/strap connection (Fig.6). Both scanning systems have already been tested at airlines maintenance facilities. Work is in progress to apply these techniques and instrumentation for inspection of Boeing aircraft and commuter planes. Portable ultrasonic flaw detectors are the most suitable candidates for deployment as data acquisition modules. These commercially available low-cost devices are widely used by the aircraft and bridge inspection and maintenance facilities. Even though ultrasonic flaw detectors do not include imaging capabilities, some of their features are suitable for the acquisition of images. Various types of ultrasonic flaw detectors from leading manufacturers (Panametrics, Krautkramer-Branson, Karl Deutsch, and Sonatest) have been reviewed to develop an adequate data transfer protocol. 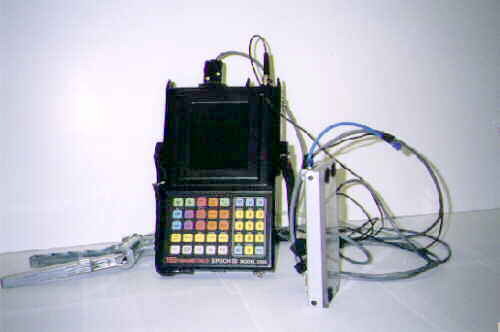 Figure 7 shows the ultrasonic flaw detector EPOCH III (Panametrics) that was used as a data acquisition module for the Fairchild SA226 Modular Inspection System. Most of the modern ultrasonic flaw detectors are PC-based or include hardware and software capabilities to communicate with computers. These features are used to transfer acquired data to personal computers (data post-processing and display module) for image processing and display. Image analysis can be performed either on-site by inspectors or by experts available off-site. A calibration specimen which is the part of a calibration module can be used either immediately before inspection as a part of the specific inspection procedure, or periodically to verify performance of the inspection system. Figure 8 shows calibration specimens for ultrasonic inspection of multilayered aircraft structures. While crack and corrosion detection tools are widely used by the operators, enhancements are needed in the detection of smaller cracks and quantitative damage assessment. As part of aircraft and bridge inspection, characterization of cracks is a vital task to ensure the reliability of the structures. It also provides information for maintenance, for instance, to decide on repair or replacement of components. For ultrasonic characterization of planar, two-dimensional defects such as cracks, plane scanning is considered by many as the most suitable data acquisition procedure. However, the complex surface profiles of airplane and bridge structures (splices, doublers, protruding fasteners, etc.) substantially restrict the movement of ultrasonic transducers and can therefore reduce the effectiveness of plane scanning. In addition this type of scanning is time consuming, and imaging equipment is very expensive. On the other hand, the application of ultrasonic dual line scanning, previously proposed by the author, reduces both the area and time required for the inspection. . Another advantage of dual line scanning is that it can be applied in conjunction with portable ultrasonic flaw detectors as data acquisition modules. To obtain information on crack sizes two linear scans are acquired. For example, circumferencial and radial linear scans are usually acquired to inspect pins in pin-hanger assemblies for planar cracks or to detect radial cracks around fasteners in aircraft structures. Times-of-flight and amplitudes of the signals transmitted through the cracked area and reflected from the crack can be used to generate data for crack imaging. The images that are generated at the time of circumferencial (Fig. 9a) and radial (Fig. 9b) scans can be superimposed to produce 3-D image of the flaw (Fig. 10). Figure 11. 3-D images of triangular (a) and rectangular (b) radial cracks around fasteners in multilayered airplane structures. The modular concept of inspection techniques and systems makes it possible to apply ultrasonic imaging to inspect aircraft and bridge structures regardless of the type of ultrasonic equipment available at inspection or maintenance facility. This approach will improve user efficiency, allow maintenance cost reduction, and ultimately extend life and enhance safety of airplane and bridge structures. This work was supported by the FAA through the Airworthiness Assurance Center of Excellence and by the Infrastructure Technology Institute of Northwestern University.